Are you shopping for a midsize SUV? If you are looking for one that has an outside that will impress you and those around you, consider the popular Highlander. We feel this Toyota SUV could be just what you need. There is a certain look that every Highlander has, and that look is made possible because of the special lighting that is part of the vehicle's exterior. The wheels of the Highlander help to add to its appearance, too. The alloy wheels of this vehicle give it a beautiful finish. 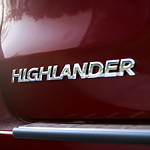 Are you interested in learning more about the Highlander and seeing the vehicle up-close? We would love to have you stop by our showroom. The team at Capitol Toyota is waiting for you and ready to answer any questions that you might have. When you come by, you will have the chance to test drive this SUV from Toyota.